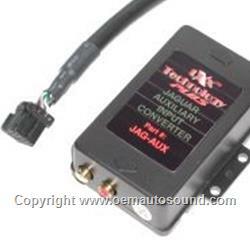 Jaguar auxiliary audio input interface, this aux adapter will allow you to input audio into the Jaguar factory radio, the interface will plug into the external CD-changer port. It allows you to listen to an external audio device mp3 iPod iPhone through the factory Jaguar car stereo no more sound degrading FM modulator or transmitter, or tape adapters this is not a universal part the interface was made to be used on Jaguar s type vehicles. If the vehicle is pre-wired for a 6 CD-changer it needs to be unplug and you can plug the auxiliary interface for CD-changer cables JAGW-AUX no need to remove the radio.